"This recipe takes time but you won't be disappointed. 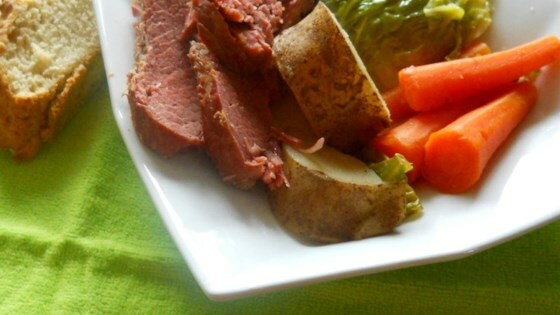 Give yourself a little luck o' the Irish with this Americanized version of an Irish feast. Serve with butter and Irish soda bread." In a 6 quart Dutch oven, Place the beef brisket, peppercorns, garlic powder, onion, bay leaves and salt. Fill pan with water to cover everything plus one inch. Bring to a boil and cook for 20 minutes. Skim off any residue that floats to the top. Reduce heat to a simmer and cook for 2 to 3 hours, until meat can be pulled apart with a fork. Once the meat is done, add the cabbage, potatoes and carrots, pressing them down into the liquid. Simmer for an additional 15 minutes or until the potatoes are tender. Skim off any oil that comes to the surface. Stir in the butter and parsley. Remove the pot from the heat. Remove meat from the pot and place onto a serving dish and let rest for 15 minutes. Also remove vegetables to a bowl and keep warm. Slice meat on the diagonal against the grain. Serve meat on a platter and spoon juices over meat and vegetables. This is THE BEST. I made it in the crock pot and the corned beef was so tender and everything was so tasty. I won't wait until next St. Patty's Day to make this again. Fantastic!!!!!! Very easy to make and it was very delicious. I let it cook on top of my stove and it smelled up the whole neighborhood. Good thing I like cooking and company.